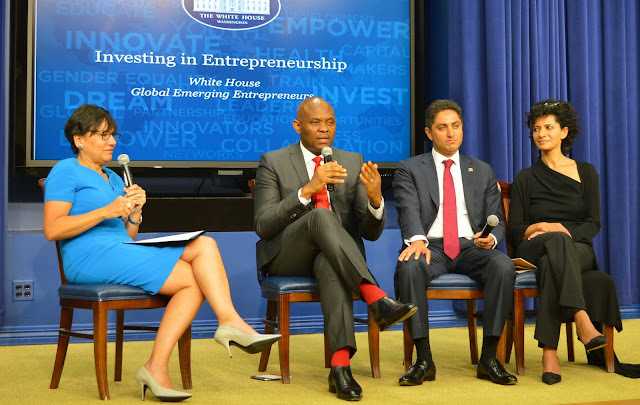 Elumelu, who had earlier delivered a speech at the White house in Warshington DC at an event hosted by United States President Barack Obama on May 11, 2015 to celebrate emerging entrepreneurs around the globe, said Africa is offering investors one of the highest returns on capital in the world, which has made the continent one of the best places to be an entrepreneur globally attracting significant foreign direct investments (FDI) from both Africans and foreign investors. Citing UBA as an example of African owned business doing great on the continent, Mr. Elumelu said,”the United Bank for Africa, which I chair, employs about 12,000 people and provides banking and financial services to 8 million Africans and businesses in 19 African countries, with a presence in Paris, London, and New York. 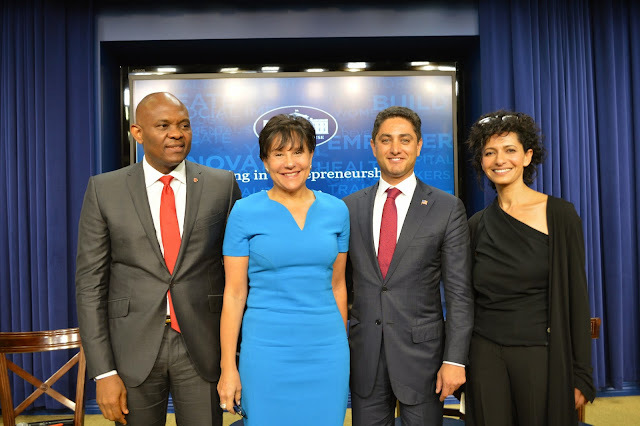 "Penny Pritzker, US Commerce Secretary, Tony Elumelu, Founder, Tony Elumelu Foundation, Antonio Gracias, Founder and CEO, Valor Equity and Julie Hanna, Founder and CEO, Kiva during the event hosted by US President Barack Obama at the White House to celebrate Global Emerging Enterprenuers”. He also cited MTN as another example of an African company that has grown to be a multi-billion dollar telecommunications company that operates in 17 African countries, as well as Europe and Asia, enabling hundreds of millions of individual Africans and their businesses to communicate with their families, customers and markets. Another noteworthy example, Elumelu said, is Dangote Cement, which is operating in six African countries and helping to build Africa, one brick at a time. He disclosed that a soon-to-be released book, “Africans Investing in Africa,” a research partnership between the Tony Elumelu Foundation and the Oppenheimer family’s Brenthurst Foundation will reveal how many African companies are creating hundreds of thousands of jobs, in different countries and contributing to the integration of the continent each day. 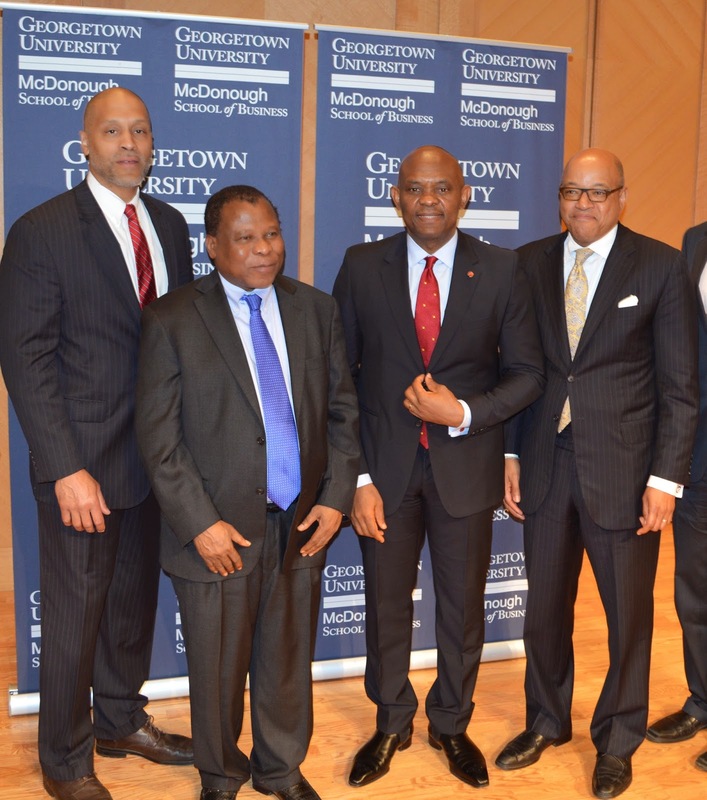 l-r: Scott Taylor, Director, African Studies, Georgetown University, Ade Adefuye, Nigerian Ambassador to the US, Tony Elumelu, Founder Tony Elumelu Foundation and David Thomas, Dean Georgetown Business School when Elumelu delivered the lecture on Entrepreneur -led Development; A new model for Africa’ at Georgetown University in Washington DC. Private sector growth in Africa, he said, is driving the growth of infrastructure, housing, financial inclusion and economic stability which all adds up to increased development based on economic opportunity. “This is what I have been preaching; that the private sector has a role to play in Africa’s development. I call this Africapitalism” Elumelu said. Tony Elumelu, Founder Tony Elumelu Foundation, Penny Pritzker, US Commerce Secretary, Antonia Gracias, Founder/CEO Valor Equity and Julie Hanna/CEO, kiva during the event hosted by US President Barack Obama at the White House in Washington DC to celebrate global emerging entrepreneurs. 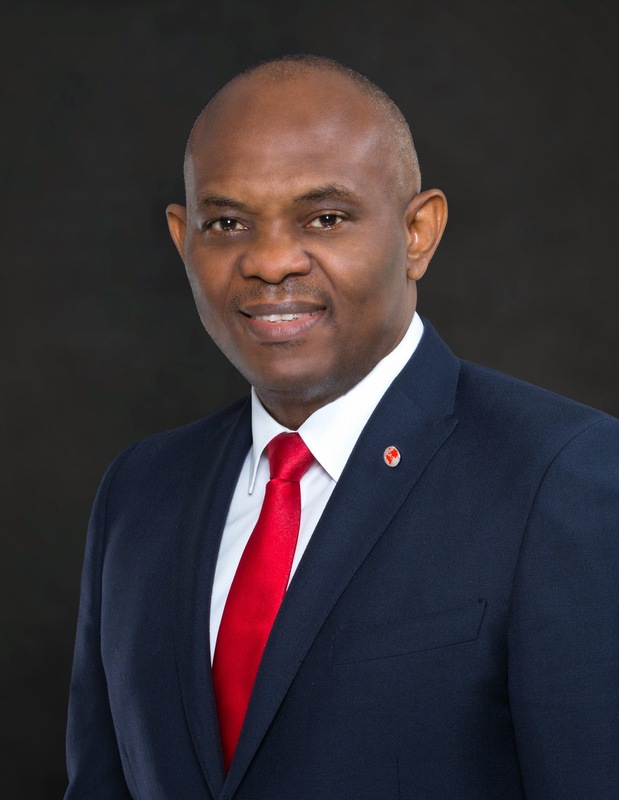 “I have come to understand that the most important thing I can do to advance our development is to help replicate my success in others and to evangelize the cause of entrepreneurship” Elumelu said. The lecture was attended by a large audience including students, faculty, and alumni of Georgetown University, as well as members of the US and African private sector, diplomatic core, and international development sector. I think that all developments are steps forward. You can read advices on how to cite poem and it will be something new for you, too.